Amanda Abbiehl and I share a similar story. 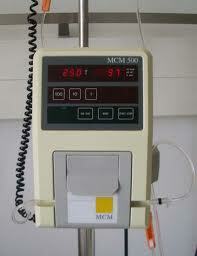 Both of us were on patient-controlled analgesia (PCA) pumps to manage our pain. However, the difference is that, by the grace of God, an observant nurse who just happened to walk by my room when I stopped breathing, called a “Code Blue”, and that ultimately saved my life. I would have been just another statistic if it wasn’t for that nurse. Unfortunately, Amanda was not so lucky. What are the odds of a nurse putting her head into a patient’s room just as that patient is experiencing respiratory depression? Slim. What are the odds of that same nurse putting her head into the patient’s room after she had just checked on him 15 minutes before? Almost none. Yet, that is what happened to me and I ask why. My story begins in 1990, when I was a state trooper. My squad car was struck by a car driven by a drunk driver. Although the accident left me close to being a quadriplegic, I went through 6 months of physical rehabilitation and returned to work. Although my doctors told me that I would always have trouble with my neck, I was able to function at my job despite the pain. I was even named a district Trooper of the Year in 2001 and prior to that in 1994 received a statewide traffic safety award for arresting the most drunken drivers per capita. But, despite being recognized again in 2003, as Trooper of the Year for in Bridgman, MI, my neck injury increasingly gave me problems. In December 2002, the neurologist who read my MRI told me that I shouldn’t be a trooper anymore. He said, if I get hit again, I’d be a quadriplegic. In January of 2003, I met with Indianapolis neurosurgeon Dr. Henry Feuer, who was (and I believe still is) a consultant for the Indianapolis 500 and the National Football League. Dr. Feuer told me that my condition had worsened and that my neck looked like that of a retired football player with arthritis, bone spurs and spinal fluid unable to circulate effectively. Dr. Feuer gave me two pieces of bad news. The first was that I needed surgery. The second confirmed that I couldn’t be a state trooper any more. So, I underwent neck surgery that year at Methodist Hospital in Indianapolis. Because of the pain that I was in, I was on a morphine pump after my surgery. The night after my surgery, a nurse had just checked on me and then continued to check on other patients on the very large hospital floor. Another patient she was caring for needed something. Although it was on her cart, she decided to go to the supply room and restock her cart. Fortunately for me, her path to the supply room led her passed my room. So, even though she had just checked on me 15 minutes earlier, she just so happened to be passing my room when she noticed I was not breathing and called a “Code Blue”. She would tell me later while she was crying that she did not know what made her walk past my room. While she continued to sob she told me that she had never seen anyone live after they had coded. I remember feeling warm, calm and in a better place. There was a point where I had to decide if I wanted to fight back and live or stay dead and remain in that warm pleasant place. I chose to fight and recall being jolted back, I remember doctors over me, bright lights, and someone holding my hand. Miraculously, I survived. The doctors told me that 96% of Code Blue patients die; only 4% live. I remember later on that morning that I was somewhat of a spectacle for the student nurses. They would come into my room and stare at me to see the patient who had cheated death. I had been without oxygen for 6 minutes. At seven minutes, I was told, I would have been brain dead, if not dead permanently. I died at 4:11 AM, and for many years after I would wake at 4:11 in the morning remembering what happened to me. I was never electronically monitored. There was nothing that would have indicated to a nurse that I was about to experience respiratory depression and almost die. I was 39 years old and in terrific health. I was not a high-risk patient. Why? Had my PCA pump been integrated with a capnography like the one just recently discussed at the Notre Dame class, the pump would have shut off and alerted my nurse that I was not breathing. Instead, I am alive today because my nurse, who had just checked on me 15 minutes earlier, just happened to be passing by my room when she didn’t have to. I say to Brian and Cindy Abbiehl – My deepest condolences. Know that your daughter died peacefully. Know that that she was not in any pain or under any stress. I say to all hospitals that care about their patients’ safety and welfare — Electronically monitor ALL your patients, not just the ones at high risk. A human life is too valuable for you not to. All hospitals need a technological safety net for their patients. All nurses and caregivers need that safety net too. Read more about the dangers of PCA pumps in part 1 and part 2 to find out about 9 sources of danger. Contact us at Med League for well-qualified experts to review PCA overdose cases. This blog post was shared by the Physician-Patient Alliance for Health & Safety. About Physician-Patient Alliance for Health & Safety: Physician-Patient Alliance for Health & Safety is an advocacy group devoted to improving patient health and safety. Follow PPAHS on Facebook and on Twitter. See the PPAHS website.